How much time, money and effort have you spent painting the siding on your home in Minot, ND? Well, there’s an old saying that: you never really “own” a paint job – you just “rent” it – until it’s time to repaint. Sun, rain, snow, ice, time – these are all natural phenomena that eventually deteriorate the condition of your painted siding. However, there is a permanent solution – steel siding from ABC Seamless. Our metal seamless siding is coated in a high-grade finish that is resistant to fading, chipping, cracking, and peeling. It truly is seamless – Many other siding companies tout their “seamless” siding products, but only offer siding in 12’ to 24’ lengths. That’s not seamless. Our siding is manufactured onsite, to the lengths necessary to fit the precise dimensions of your home, ensuring a perfect fit. It offers maximum durability – Our siding is made from heavy-gauge, hot-dipped, G-90 galvanized steel, which is stronger than almost any other siding product on the market. It is energy efficient – Before our siding goes on, we add a base layer of premium insulation to further reduce heat transfer through the walls, meaning extra savings in energy for you! It comes with an unbeatable warranty – Your siding will be protected with a lifetime, non-prorated, transferrable warranty so you won’t need to worry about your investment. What’s more, we’ve never discontinued a color. 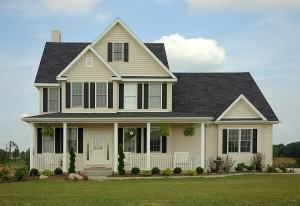 If you’re planning future additions to your home, farm, or other buildings, we’ll still have your siding – color and style – to complete the project. Nobody does it better! Choose the original siding without the QUACKS™! Contact ABC Seamless today for more information about our home siding for residents of Minot, ND, today.